Intuition is a sense that allows you to immediately understand something without going through the steps of conscious reasoning. This sense helps you to make better decisions to ensure that these decisions have a positive impact on your life. 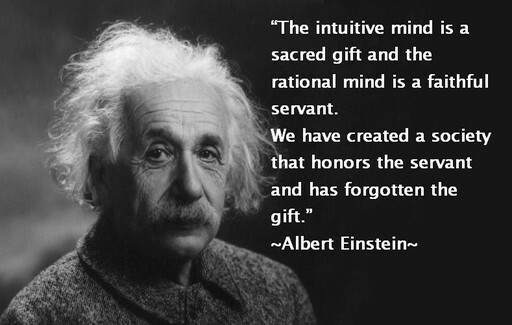 People often refer to intuition as having a "gut feeling" about something because their subconscious is guiding them. Everyone has intuition, but you can strengthen it to improve upon the effectiveness of your decision making for a happier and more fulfilled life. Meditation allows you to center yourself and renew your focus. This is an important aspect of intuition because those who are intuitive tend to know themselves well and are able to focus easily when the situation presents itself. When you meditate, you are quieting your mind so that you can concentrate on the messages that your subconscious is trying to send. If you have a major decision to make, take the time to meditate so that you can focus on it and really think it through. Meditation allows you to push everything else out of your mind so that you can solely focus on the decision at hand. Your dreams are often trying to tell you something even though it is often difficult to decipher what this message is. Dreams happen when your cognitive mind is busy so that messages from your subconscious can get through to you. Your cognitive mind is at rest when you are sleeping, creating a pathway for your subconscious mind to send you messages and signals. When you wake up each morning, take a few minutes to jot down some information about your dreams so that you can refer to them later to see what they are trying to tell you. Creativity is mind opening, allowing you to get in touch with your intuition. Something as simple as doodling in a sketch pad gives you a chance to quiet your cognitive mind so that your intuition is brought to the surface. If you have a major decision to make or you have a feeling about something that is really bothering you, grab some art supplies and get creative. If you are not into art, consider keeping a journal where you can make note of your thoughts and hunches to refer back to later. You will not know how strong your intuition is until you take the time to test it and testing your hunches is the best way to do this. If you have a gut feeling about something, you should pursue it. Make sure to also write your hunches down so that you can view them in the future to see how accurate they were. Hunches you can easily test are things like betting on a horse if you have a feeling which one will win or going against with the meteorologist says because you have a feeling about the weather. These are hunches that you will get almost immediate feedback on. When you are working to strengthen and get in touch with your intuition, take a break from the norm can be beneficial. If you have a major decision to make, take a day to clear your schedule and forgo trying to focus on tasks that require a lot of thought and attention. The point to this is to clear your mind so that your intuition has a chance to speak to you. One of the best things that you can do is take some time from your schedule to spend time in nature. Nature naturally opens your mind and it allows you to reflect in a way that no other environment can. Take a hike or simply sit somewhere in the woods or in a field to let nature help you in listening to your intuition. As you can see, intuition is a critical part of who you are and the decisions that you make. Having a strong sense of intuition allows for a better life because you can make decisions more quickly and make decisions that will positively impact your life. Taking the steps to strengthen your intuition is important and this is something that everyone should take the time to work on. When you combine both intuition and logic, you are able to think more clearly and choose things that are most beneficial for you.